'Race of Truth' Season is Here! 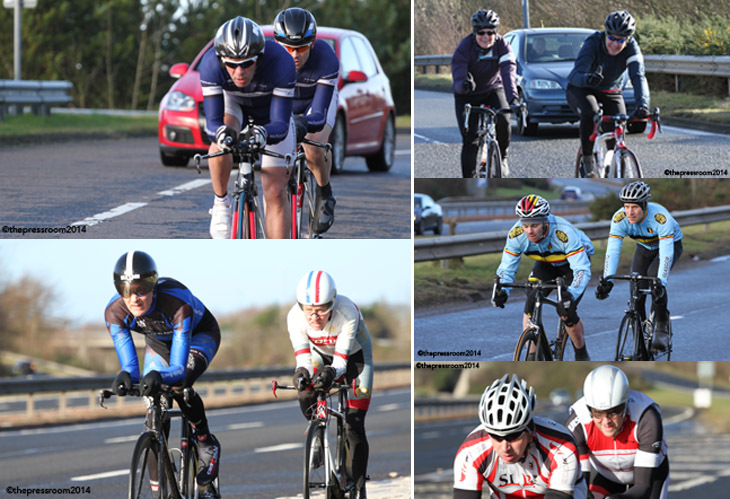 Last Sunday saw the traditional season-opening TT, the Ice Breaker 2-Up, take place at Irvine and for the second year in a row the weather gods smiled on the event. 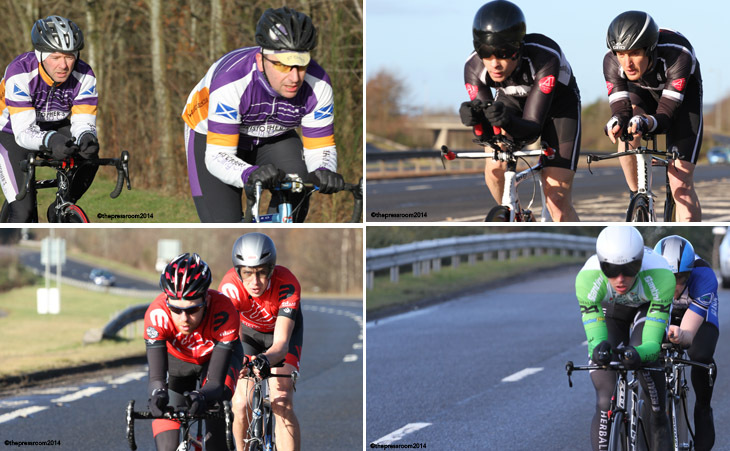 Fullarton Wheelers once again put on an excellent event and clubs from all over the Central Belt had travelled to Ayrshire to take part. Although The Press Room hasn't officially been going for a full year yet, we covered the 2013 event for VeloVeritas (http://www.veloveritas.co.uk/2013/02/17/fullarton-wheelers-ice-breaker-2013/) and this year's event was every bit as good. The time-keeper waved away 55 teams of two and two single riders and all but three teams (and a single rider) completed the course within 30 minutes. The title was wide-open this year as the winning team from last year, Stevie Blom and Ben Peacock (Paisley Velo) were not paired for this event. Ben Peacock was teamed instead with new Velo rider Gerry McGarrity who moved across from Inverclyde Velo in the off-season. They were the last team off and returned in a final time of 20:54 but unfortunately this was only good enough for third spot on the day, albeit within the same minute as the winners. The undoubted stars of this year's event was the pairing of Silas Goldsworthy and Alan Thomson riding for Sandy Wallace Cycles and they completed the course in a time of 20:21 to take the race from the second placed team of Steven Lawley (Herbalife-Leisure Lakes Bikes) and David Griffiths (Glasgow Wheelers) who finished 17 seconds further back. The Women's race was taken by the very talented pairing of Toni McIntosh and Lynne Wardrop for Ayr Roads CC in a time of 25:40. The course is a tried and tested one with the base at Eglinton Country Park in Irvine. Away from the starter, up onto the first roundabout and then down onto the duel carriageway, taking care where vehicles can exit as well as enter. Then it's due south to the Papermill Roundabout and return to finish just before the exit back up to the first roundabout again. The sun came and went as the odd cloud passed overhead but this had a noticeable effect on temperatures and the slight breeze. By the end, the breeze had turned around and was a slight headwind for the final runners but even just 30 minutes earlier riders were reporting the breeze in the opposite direction. 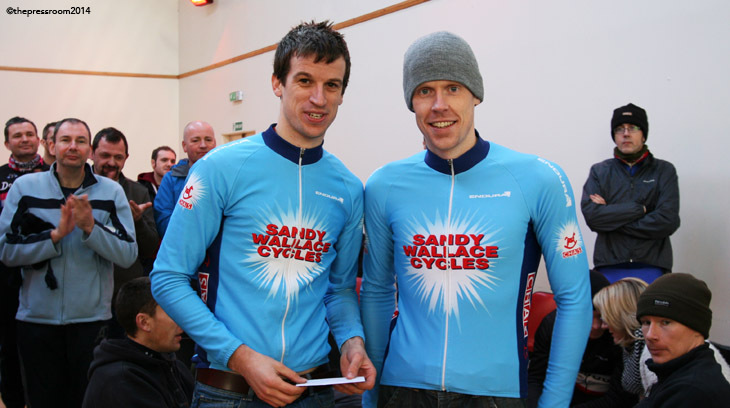 The early pacesetters was a composite team of Gary Bratt (Lomond Roads CC) and Nick Tryon (Dooleys Cycles RT) who came back with a time of 21:59. Off so early in the field meant that they had to wait just over an hour before they saw their time bettered by Neil Walker and Charles Vincent (Walkers Cycling) by 8 seconds, bringing the time to beat down to 21:51. This was good enough on the day for 4th place overall and it was satisfying for the team from Kilmaurs as Charles Vincent had punctured on the way to the start line in last year's event. 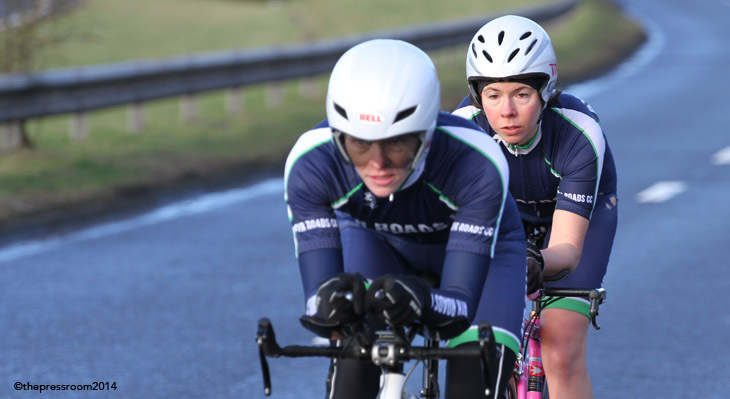 It was a good day for Walkers Cycling as they also took 2nd place in the Women's event with Lorna Sloan and Lorna Todd in 28:05, with an honourable mention for the composite team of Catherine Logan and Russell Mowat finishing in 27:57. To much applause, the 'lantern rouge' prize went to Fiona Walker and Fiona Wallace in a time of 33:32. Other random 'honourable' mentions go out to the pairing of ever-popular Jocky Johnston (Icarus Racing) and Tony 'Spider' Nugent (East Kilbride RC) in 25:09, John 'The Slab' Campbell and Steven Smith (Royal Albert CC) in 25:27 and the pairing of Jen Mason and Jill Morton (unattached) in 30:27. We won't go into detail about Steven Smith's 'clothing' malfunction just before the start and Jen and Jill appeared to smile all the way around the course. 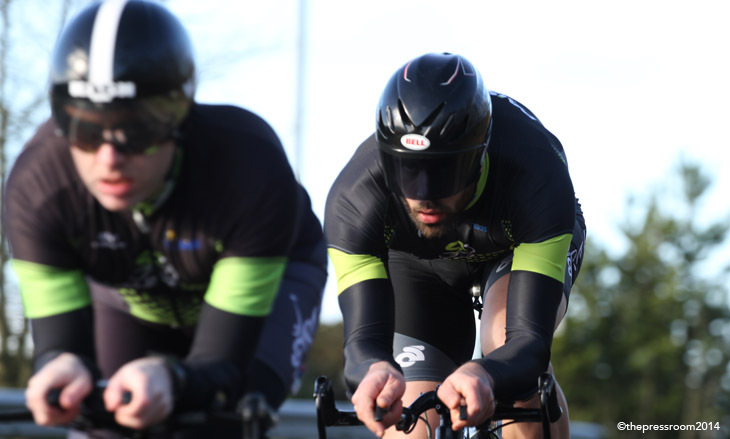 Special mention also to Michael Robb (Ayr Roads CC) who managed a very creditable time of 22:40 riding on his own and Jennifer Nicol (Fullarton Wheelers CC) in a similar predicament returning in 32:38. And extra special mention to Neill Kemp (Glasgow Nightingale CC) who took a slight tumble but still finished in a time of 24:27 with Gavin Thomson. 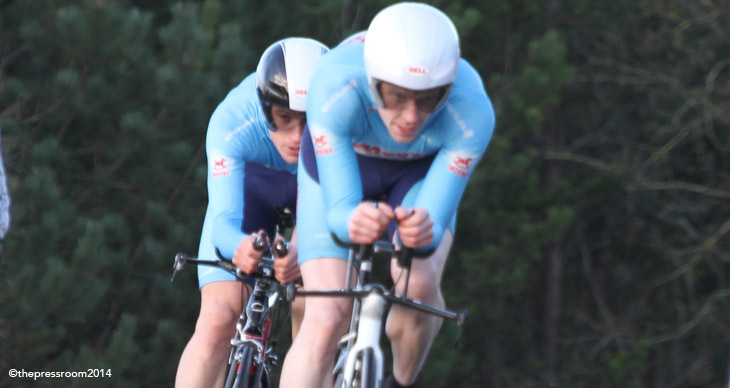 It was also great to see former stalwart of the old Erskine RC John Craig who has returned to racing and came home in a time of 22:53 with Greg Kerr both now riding for Team Thomsons Cycles. 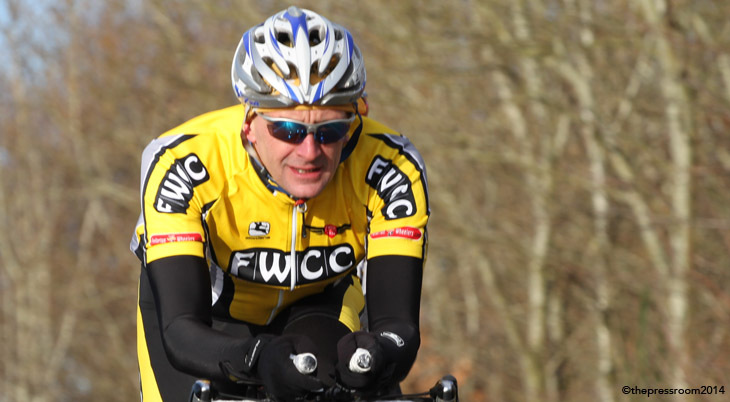 Greg only started cycling when Thomsons Cycles re-opened so we'll keep an eye on him. Their race was good enough to take second spot in the vets race and 9th overall. In conclusion then, this year's Ice Breaker lived up to its reputation as the first true test of the season. It was another fine example of organisation from the host club with the top three teams all looking ahead to a 2014 which should see some blistering performances…but the day belonged to the popular team of Alan Thomson and Silas Goldsworthy. Well done!